Define the relationship between intratumour heterogeneity and clinical outcome following surgery and adjuvant therapy (including relationships between intratumour heterogeneity and clinical disease stage and histological subtypes of NSCLC). Establish the impact of adjuvant platinum-containing regimens upon intratumour heterogeneity in relapsed disease compared to primary resected tumour. Develop and validate an intratumour heterogeneity (ITH) ratio index as a prognostic and predictive biomarker in relation to disease-free survival and overall survival. Establish dynamics of tumour evolution during the disease course from early to late stage NSCLC. Initiate a longitudinal biobank of circulating tumour cells (CTCs) and circulating-free tumour DNA (cfDNA) to develop analytical methods for the early detection and monitoring of tumour evolution over time. Develop a longitudinal tissue resource to serve as a platform to assess the relationship between genetic intratumour heterogeneity and the host immune response. Define relationships between intratumour heterogeneity and targeted/cytotoxic therapeutic outcome. Use a lung cancer specific gene panel in a certified Good Clinical Practice (GCP) laboratory environment to define clonally dominant disease drivers to address the role of clonal driver dominance in targeted therapeutic response and to guide stratification of lung cancer treatment and future clinical study inclusion (paired primary-metastatic site comparisons in at least 270 patients with relapsed disease). TRACERx aims to recruit 842 patients with stage I-IIIA non-small cell lung cancer (NSCLC) over a three to four year period. Each patient will be followed for a total of five years. The TRACERx study will make use of a range of research techniques and technologies. Increasingly, deep sequencing analyses are revealing the vast clonal heterogeneity present in solid tumours including NSCLC, and the spatial and temporal dynamics of cancer subclones that emerge during the disease course and following acquisition of drug resistance. Biopsies will be taken from different parts of each patient’s tumour and analysed with the latest sequencing technology, giving a comprehensive genetic profile for each patient. TRACERx will utilise genomic data derived from in depth multi-region sequencing analyses of tumours over time to develop an improved understanding of the relationships of phenotypic and genetic intratumour heterogeneity with cancer evolution. Laboratory work to define the functional relevance of these genomic datasets in NSCLC will also be undertaken. Ultimately it is hoped that this will support the development of novel therapeutic approaches to limit relapse and improve outcomes in NSCLC. Tumour heterogeneity has been shown to present profound problems from a tumour sampling perspective, particularly in the metastatic setting with the emergence of metastases that may be composed of distinct tumour subclones. The advent of technologies to detect circulating tumour cells (CTCs) and circulating free DNA (cfDNA) has the potential to revolutionise and simplify the monitoring of tumour evolution over time. The difficulties inherent in repeat tumour sampling emphasise the unmet need for the development of sensitive, minimally invasive circulating biomarkers (CTCs and cfDNA) to attempt to resolve the extent of heterogeneity within one patient. Circulating biomarkers have the potential to monitor minimal residual disease, forecast early progression, document subclonal evolution through therapy and shed light on the genetic events permissive for tumour progression, metastases and intrinsic or acquired drug resistance. Moreover, in patients with advanced metastatic disease where biopsies of multiple tumour sites are not only impractical, but also distressing for the patient, it will be important to formally determine how well CTCs and cfDNA analyses reflect tumour heterogeneity present in primary and recurrent disease and provide genetic information that may forecast the emergence of drug resistance. Therefore, in parallel with molecular analysis of spatially separated and sequential tumour biopsies, a unique TRACERx biobank will be developed of isolated CTCs and extracted cfDNA collected serially from TRACERx patients, with which to subsequently investigate their clinical utility. The discovery of novel targets to improve outcome is a key element in any comprehensive programme of lung cancer research. Whilst emerging evidence suggests that intratumour heterogeneity may significantly limit the anti-tumour activity of targeted therapeutics, its overall effect on the anti-cancer immune response may prove tractable, since high levels of intratumoural mutational diversity may generate neo-antigens perceived by the immune system as non-self, thus providing relevant targets for immune-based therapies. TRACERx will provide the future resource to define how intratumour heterogeneity impacts upon cancer immunity throughout tumour evolution and therapy. Such studies will help to define how the clinical evaluation of intratumour heterogeneity will inform patient stratification and the development of combinatorial therapies incorporating conventional, targeted and immune- based therapeutics. 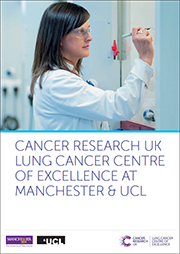 This landmark study will bring together more than 80 lung cancer researchers in the UK, including oncologists, pathologists, laboratory researchers and technicians based in hospitals, universities and research institutes.